You can AirPlay a video directly from the QuickTime movie player in Mac OS X with the latest versions. This makes it easy to send a video that’s playing on a Mac to an Apple TV over the wireless AirPlay protocol, similar to how it works to AirPlay videos from iOS. And because AirPlay is also supported by third party apps and media players like Kodi (XBMC), you don’t have to have an Apple TV to use the feature, as long as another computer or media center is running a compatible AirPlay receiver it can receive the AirPlay video from QuickTime. 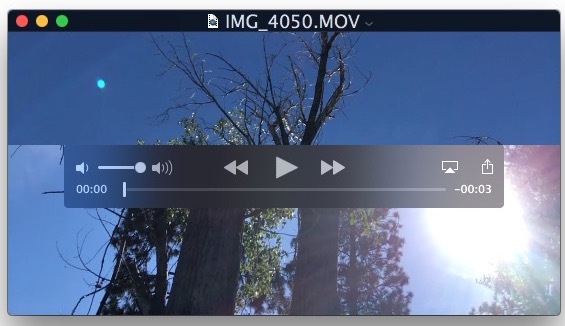 Streaming an AirPlay Video from QuickTime Player to an AirPlay receiver works with any video that can be opened in the application, though it does require OS X El Capitan 10.11 or newer to have the feature. This is a great feature for playing video on a larger screen, whether it’s for presentations, showing something off, or watching a movie from your Mac. This works great with streaming video to the Apple TV, but if you don’t have one you’re not out of luck. If you don’t have an Apple TV to use as a receiver and you want to try this out yourself, you can download free receiver software like Kodi TV (formerly XBMC) to any other Mac or PC for free, and as long as you enable AirPlay support in the app it can take video or audio from any Mac or iOS device using the AirPlay protocol. Yes that means you could stream video from your Mac to a Windows PC elsewhere in your house if you wanted to. 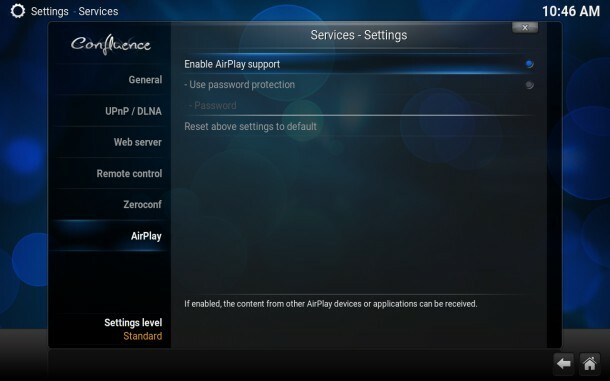 Adjusting Kodi TV to accept AirPlay video is easy, open the app and navigate to “Settings” then to Services, and choose to enable “Enable Airplay Support” (you can set a password if you want). Once Kodi TV has been configured to accept AirPlay, as long as the two Macs (or Mac, Windows, etc) are on the same networks, you’ll be able to find the Kodi player as a receiver for AirPlay from QuickTime or an iOS device. Of course this only streams the video that you’re viewing and playing in QuickTime, making it different from AirPlay Mirroring, which quite literally sends the entire Mac screen and whatever is on it to the AirPlay destination, effectively expanding the Mac display to the other screen. AirPlay Mirroring is also available in iOS and works much the same, and AirPlay Mirroring can also be used with the aforementioned Kodi TV player app or Apple TV as well. But if I go to the Sound menubar and Option-Click on it I *can* successfully choose to send (all my Mac’s) sound to an Airplay device. Well yes of course you need a compatible Mac to use AirPlay. Not surprisingly, my Macintosh SE/30 does not make the cut, but I’m not flipping out because it’s not mentioned. One expects the user has some general idea of what their computer is capable of and what model year, and if something doesn’t exist, perhaps it doesn’t support it. Like, my iPhone 6 doesn’t have 3D Touch, not complaining about that and smashing the screen! AirPlay is either in QuickTime or not, if you have a receiver. That’s how you know. Yes, Airplay otherwise works perfectly for me – in fact right now I’m streaming Apple Music from my 2012 Mac mini to powered monitors in my living room. But for some reason Airplay in QuickTime Player just does not work – the app gives me that ‘Looking For Devices’ pop-up but never finds anything, and I didn’t have any resources with Airplay on at the time. I find I’ll get the Looking for devices error if I’m connected through my VPN.